Eastern Europe is where East meets West, and this clash of cultures has shaped the region. Except for Greece all of these countries were a part of the Communist “Eastern Block.” Also this region is where the Orthodox, Catholic, and Muslim worlds intersect. As a result there are nearly 10 million Muslims in the region (7%), and the only Muslim majority countries in Europe are found here: Albania, Bosnia and Kosovo. Likewise the Protestant Reformation did not deeply penetrate this region. As a consequence Evangelical Christians are few. Eleven of the sixteen countries are less than 1% Evangelical. Eight of the countries – half the region — are less than 0.5% Evangelical. Overall the region is 1.56% evangelical compared to 2.5% for Europe and 7.9% for the entire World. Europe’s least evangelized countries are found here: Kovovo, Bosnia, Albania, Macedonia, and Montenegro. Several of the most challenging unreached people groups in Europe are in this region. 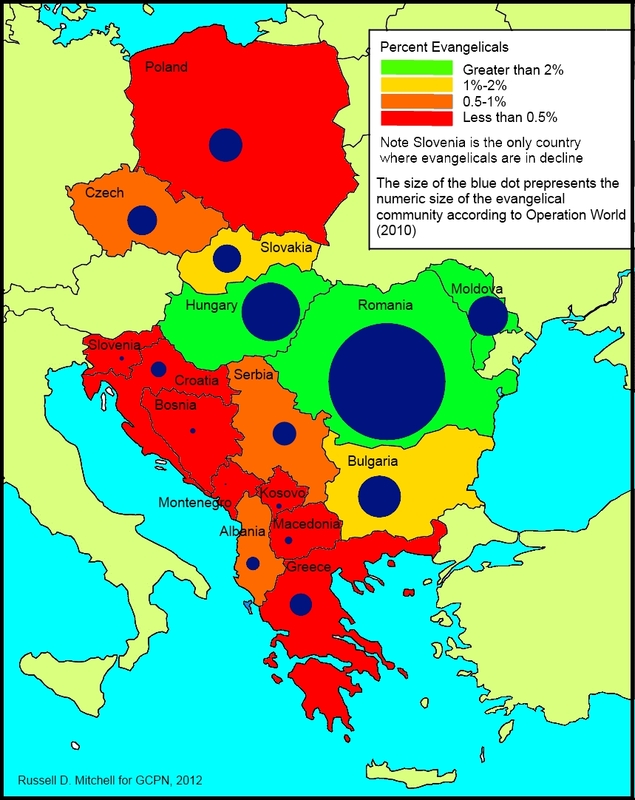 For example the Bosniak people group is perhaps the least evangelized in Europe – 2.2 million people spread over nine countries in the region. In spite of these challenges, God is at work in this region. The number of evangelical believers is growing in all but one country. In fact some of the most responsive peoples to the Gospel in Europe are found in this area. Montenegro, Albania, Moldova and Macedonia have growth rates above the world average and ten countries are better than the European average. Likewise there are significant movements developing in Romania. Throughout the region the Romani people (gypsy) are generally very responsive to the Gospel. Among established churches there is a growing vision for church planting and cross cultural work. These are some signs that God is at work in the region. Still there are significant challenges to making disciples of each people group in this region. The Mongolian Empire spread by Ghengas Khan in the 12th century touched the eastern part of this region. Some countries were impacted by the Protestant Reformation more than others: the Czech Republic, Hungary and Romania for example. Democratic powers vs Totalitarian powers (Nazi German and Communism – Russia). Every nation in the region was under the yoke of Communism except Greece. Relations with the European Union now greatly influence the development of region. 2. There are 9.7 million Muslims in the region (7%). Three countries have a Muslim majority (Kosovo, Albania and Bosnia). Another four countries have significant Muslim populations ranging from 12% to 31%. There are twelve large Muslim people groups in the region (more than 10,000 individuals). 3. The “Christian” world is 50% Catholic, 45% Orthodox and 5% Protestant. Evangelicals are just 1.56%. 4. There are 4.7 times as many Muslims in this region (9,707,732 or 7%) as Evangelical Christians (2,076,634 or 1.56%). 5.. There are more evangelicals in Romania (1,149,647) than all other countries combined (926,987). 6. According to the Joshua Project, there are 91 “least reached” peoples in the region (“least reached” referring to a rank 1.0 on the Joshua Project scale).Together they number nearly 5.5 million people. 7. There are 23 “least reached” people groups larger than 10,000 individuals are in this region. 8. 31 languages are spoken by more than 100,000 people in the region. An additional 12 Languages are spoken by over 40,000 people in the region. 9. There are 18 distinct language groups in this region without any Scripture. Ten are spoken languages. Eight are sign languages. The deaf seem to be generally neglected in the region. 11. The number of Evangelicals is growing in all countries since 2005, except for Slovenia. For ten countries, the AAGR (Average Annual Growth Rate) for 2005-2010 is better than the European Average of 1.1%. Four countries are better than the world average of 3.0%. 12. All “Eastern Block” countries – except the Czech Republic – experienced better numerical church growth in the 1990s. It appears that the negative trend in the Czech Republic might be starting to turn. Greece (the only non-Eastern Block communist country) experienced better growth in the first decade of the new Millennium. The decade of the 1990’s was overall a better decade of growth. Examining the AAGRs for the first decade of the new millennium shows a slight trend toward greater growth in the second half of the decade as opposed to the first. 1. The church is to evangelize everyone. Of the nearly 135 million people in the zone, 80% claim to be Christian but there are just two million evangelicals (1.56%). Bosnia, Albania, Macedonia, Montenegro and Bulgaria (and probably Kosovo) are the least evangelized countries in the region (all more than 5% unevangelized according to OW). 2. Those without Christian churches in their midst are to be given high priority. High Priority countries (largest percent unreached) are Kosovo, Bosnia, Macedonia, Bulgaria and Montenegro. The Bosniak people group is perhaps the least evangelized in Europe – 2.2 million people spread over nine countries in the region. 3. Those relatively responsive to Christ should receive high priority. Montenegro, Albania, Macedonia and Moldova are hotter spots, all having a higher AAGR for evangelicals than the global AAGR since 2005. The Romani (gypsy) people in the region seem very responsive. This is an executive summary prepared for the Global Church Planting Network in January 2013. The full report, with supporting documentation is available at www.GCPN.info. This entry was posted in mission information and tagged Central Europe, Christianity, Church Planting, Eastern Europe, Evangelical Christians, Global Church Planting Network by russmitchell. Bookmark the permalink.